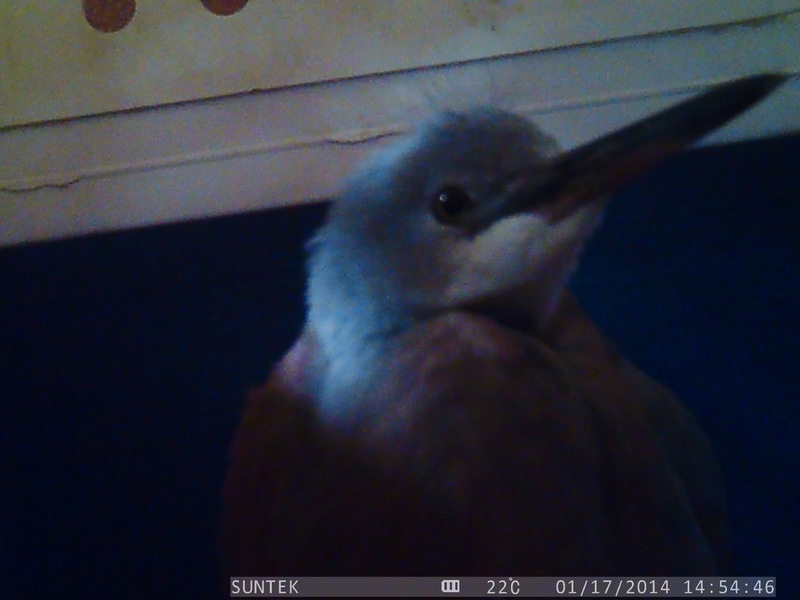 A friend arrived at our house a few days ago with an enormous dog carrier containing a little blue/grey bird. 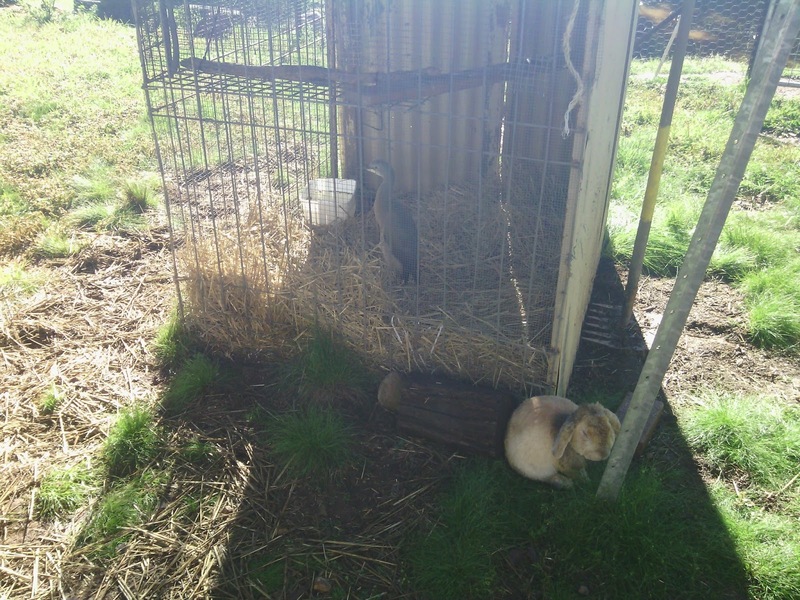 He had been flapping about on the ground in their yard and they thankfully rescued him from the dogs and cats. After a quick exam I put him in a quiet place to rest while I hunted (literally) up some food for him. 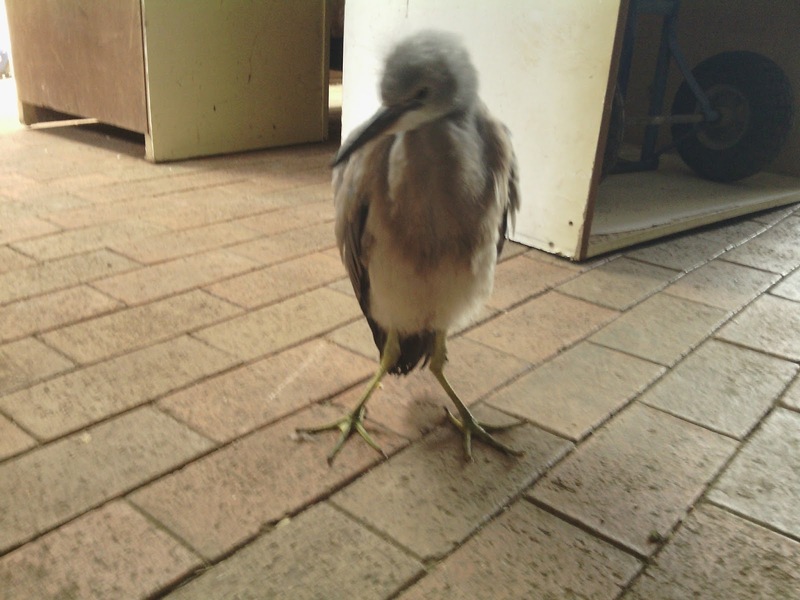 He is a White faced heron; a common water bird in this part of Australia. 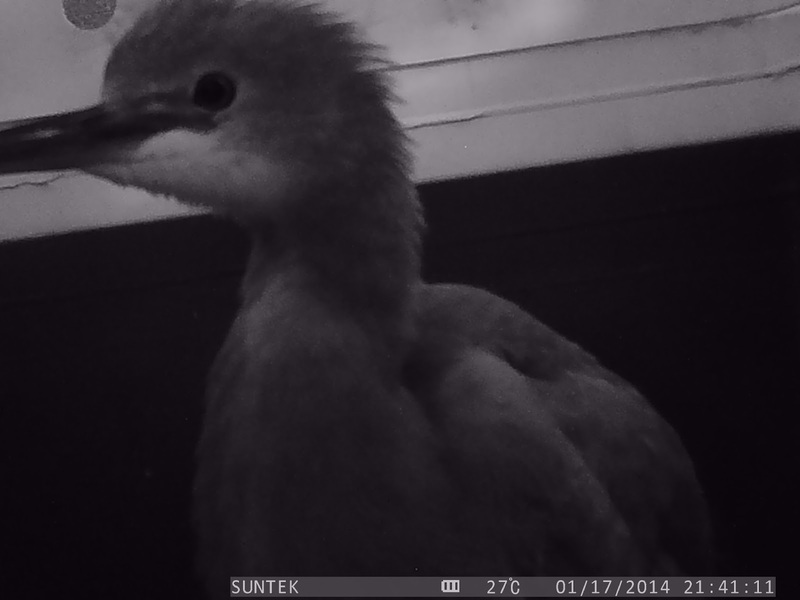 This particular member of the species (who I decided to call Angel) is a fledgling, probably about six weeks old. At first I couldn’t find anything wrong with him except he was reluctant to stand up and was very thin, so off I went to hunt food. You can see that he is sitting on his knees to eat in this photo. 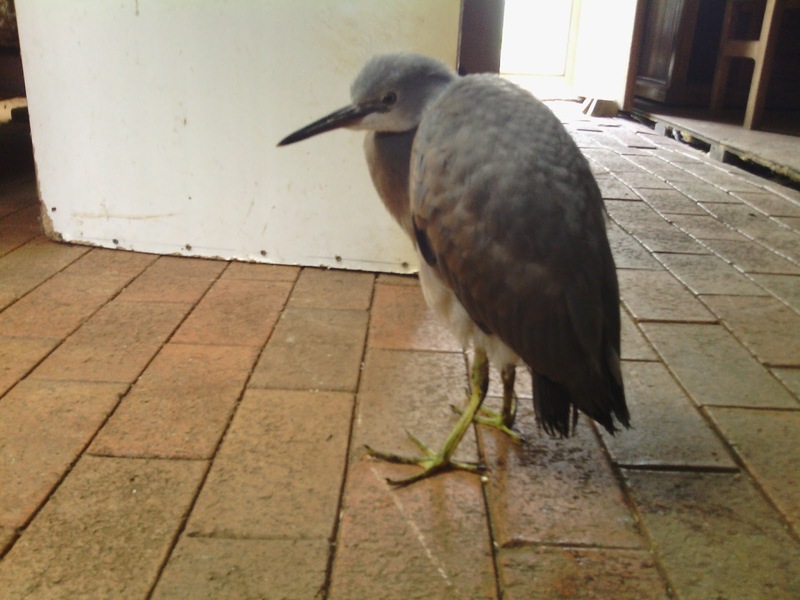 White faced herons eat lots of things; small fish, tadpoles, worms, crickets, beetles, but all of them are live and wriggling so his food needs to be live too. We took off to the river to catch some little fish for him to eat, coming home with a bucket full of tiny fish from the river’s edge. We also gathered up a bucket full of tadpoles from large puddles on the way home. These were scooped out of the buckets with a net and dumped into a shallow container of water for him to ‘hunt’. 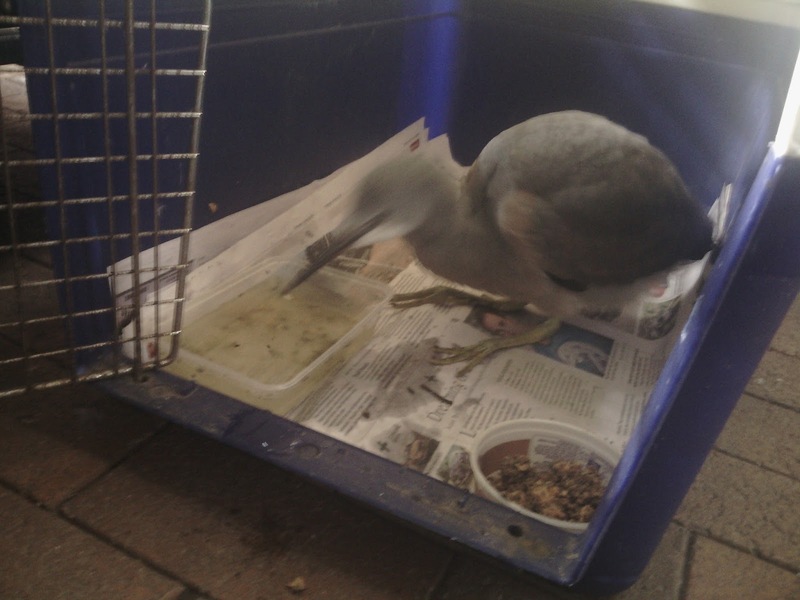 The two buckets of little animals lasted for the afternoon as he is a very hungry little heron. After three days of living in his box and only coming out so I can clean his bedding, he was put out into the aviary during the day and bought in at night. The time consuming job of fishing for tadpoles, finding bugs and digging worms to feed him has become a shared thing for the three human family members currently at home, we take it in turns to fish in the dam with a net, catching tadpoles, small fish and various aquatic insects by the hundred, turn over logs and junk in the yard and dig holes in mulched areas to find bugs and worms. With four or five feeds a day, we are decimating our future frog populations to feed him. He also gets meal worms from the meal worm farm we keep for just such a need, and crickets (which we bought especially for him). I did build a cricket trap or two, but no luck catching any wild ones yet. Rabbitto decided to come and say hello to our new guest. Now he is strong enough to stand up by himself I see he has a bend leg, maybe it’s a birth defect, maybe he had a break that healed or maybe he just stands funny; either way he is improving. 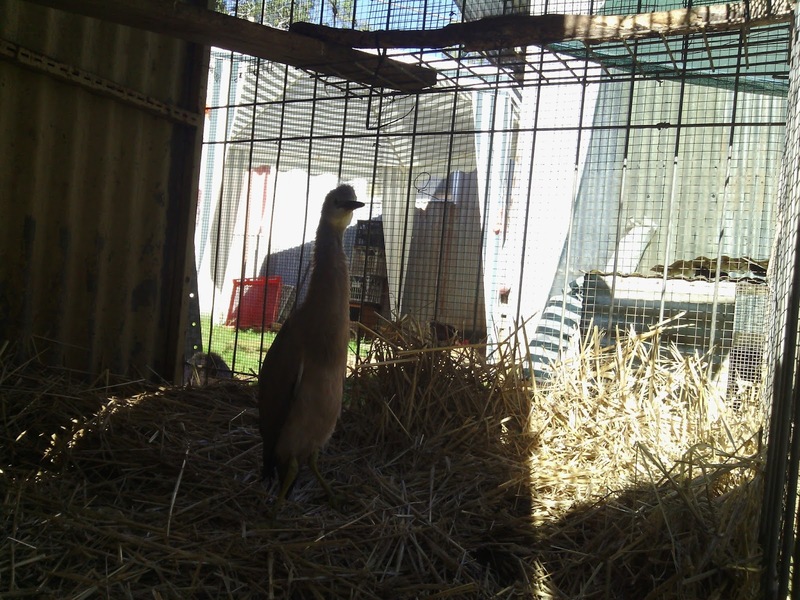 He stands for longer and longer periods of time, hunts for crickets and things in the straw on the bottom of his aviary and is interested in life around him. I am hopeful that Angel will make a full recovery and fly off into the sunrise to live his own life. You can see that his left leg has a definite extra bend at the knee.